Disclaimer: This post contains affiliate links. If you purchase something through a link, I will earn a small commission at no extra cost to you. You can read my full policy here. If you have been singing or playing a musical instrument for quite some time, you might have asked this question. The short answer is: it depends. On your goals, your current experience, your budget, and a whole lot more. If you are interested in private lessons and can afford them, they are definitely a worthy investment. This is especially true if you want to make music a career. For some students, private lessons might be out of the question due to location, lack of funds, or a number of other reasons. Here are my thoughts on who should or should not take private lessons. Another disclaimer: Everyone is different, and we all have different needs. While you may fit one of the categories below, your opinion on lessons may be different. This post is merely meant to be a guide for those unsure of the pros and cons of private music study. If you are in college or otherwise preparing for a career in music, private lessons are a worthwhile investment. Private lessons give you one-on-one time with a professional. You can learn a lot from a private teacher, from how to practice effectively to the most important works for your instrument. A private instructor will know more about your instrument than your school band director. Unless, of course, your director plays your own instrument. Starting with a thirty minute lesson once per week is a good way to get going. If you have not started college yet, you will have to take lessons as a music major. It is good to get a jump on private study if possible. If you are out of college or will not be attending college for a music degree, lessons are still important. If you see music as a career option at all, you should study privately to improve your craft. If a music career is not in your future and you want to play for fun, the choice is up to you. I am not going to tell you that you should or should not take private lessons. Taking regular lessons can be a good motivator to keep up with your practice, but lessons can cost a lot of money. If you can’t afford weekly lessons, you could take lessons once or twice a month, so that you get good instruction but can save money, too. You can also join community music groups to play music and learn for free. Networking with other musicians and learning about free or cheap resources is a great way to save money on something that is a hobby. Each instrument also has its own standard method books that you can invest in. If you are a flutist, I suggest purchasing Trevor Wye’s Practice Books for the Flute. For pianists, the Hanon exercises are the best. If you play another instrument, you can ask around for what books you should use. If you are serious about music, taking lessons is not something to consider lightly. Investing in private study of your instrument can lead to great rewards down the line. However, if you are on a very tight budget, there are some things you can do to still reap the benefits of lessons without making a huge dent in your bank account. One option would be taking lessons less frequently. This might not be the best option for college bound musicians, but it can work when you don’t have the means to study privately every week. Another option is finding a student who is willing to give lessons. Especially if you are only pursuing music for fun, you don’t need to study with the most well known professional. Ask around to see if a college music major would be able to give you lessons. The third option is finding a teacher who could do a service exchange. Is there something you could offer them, like organizing their music or finding them new students? See if a private teacher is willing to work with you to adjust their rates. If you are starting an instrument for the first time, lessons are a great idea. Unless you have access to a top notch school music program, you won’t learn much in a group setting. Private lessons will help you learn how to hold your instrument correctly to avoid injuries. Specialist teachers will also know the struggles facing a beginner. As you start your musical journey, it is wise to take lessons for a while to get a grip on the instrument. Once you have mastered the basics, you can start to learn more on your own. However, having a teacher at the beginning will make the learning process go much faster and easier. If you do not live close to a good private teacher, it can be hard to justify taking lessons. The long commute can drain you of energy before you even get to the lesson. There are options out there, such as online lessons. While these lessons, done over video chat, are not as ideal as in person lessons, they are a great way to learn if you cannot get to an in person teacher. This is also an option for anyone who wants to study with a teacher out of state. You can use programs like Skype or FaceTime to connect with a teacher without leaving your house. If you live in a rural area, far from a decent private teacher, look online to see if you can find a teacher that works for you. 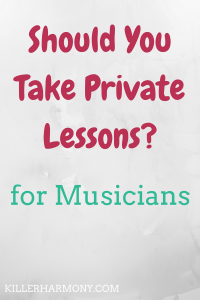 Have you taken private music lessons before? Were they worth it? Let me know in the comments, and don’t forget to download a copy of my goal planning sheet so you can plan your music goals more effectively! Previous Previous post: Flutists: Should You Play Piccolo?